If you use Square as a payment processor and have multiple Square devices, this flow will help you better understand how devices are performing and how different types of sales (cash, credit, tips, discounts) compare by device. Understanding which devices are driving the most sales, may help you make decisions on which to continue or increase using, and possibly which employees are generating the most revenue. You will also be able to compare total sales, credit transactions, tips, cash sales, and discounts by location to see which are performing best. 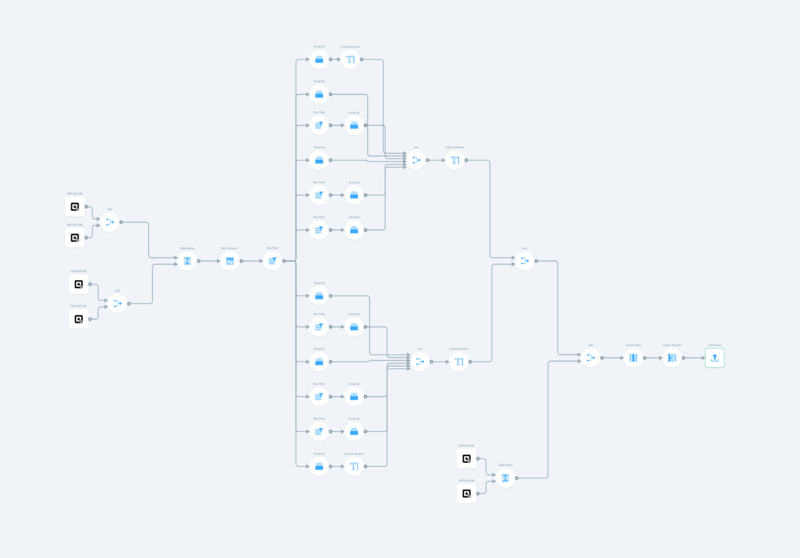 This flow pulls in transaction data from Square for each of your locations and merges all of the location data together into one table. It then filters for only transactions that have occurred in the last day. Next it splits into two branches. The top branch uses grouping to determine the average sale, total credit sales, credit tips, total cash sales, and discounts for each device. The bottom branch uses a similar grouping to determine the same values for each location as a whole. It then formats the data, pulls in location details from Square to include location names, and finally exports the data to CSV.